One of our most widely loved Irish gifts is our way of turning events into celebrations. In Ireland, even a death merits a celebration of the deceased’s life. So, in a country famous for rain, the longest day of summer is of course an event that merits some celebration. We’ve been rejoicing about the day the sun makes its longest visit here since our earliest, most ancient history – and the evidence is still here. The Hill of Tara was once the seat of the high kings of Ireland, and although it is not especially high, it does command an amazing view of the surrounding landscape. This spot was well established as a place of spiritual importance before the Celtic kings claimed it. Elaborate stone carvings at the megalithic site date back to 3000 B.C. We do not know exactly how long ago our ancestors began celebrating the summer solstice there, but the tradition continues today. On June 21st, hundreds gathered at the Hill of Tara to celebrate the longest day of the year. This year, the sun rose at 4:57 am and set at 9:57 pm, giving Ireland 17 hours and 14 seconds of sunlight. (To put that in perspective, it is nine and a half more hours of daylight than we have on the winter solstice.) For the ancient Irish, gifts from nature such as sunlight and a good growing season were important for survival. No one was popping over to Ibiza for a bit of sun in those days. Sites such as the Hill of Tara and Newgrange, both in County Meath, were important enough to be decorated with incredibly detailed stone carvings. We can only make educated guesses about the meanings of these designs and symbols. One spiral carving at the Hill of Tara is believed to relate to time and seasons; possibly it was used as a sort of calendar. 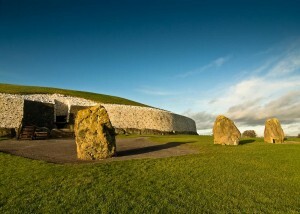 The triple spiral at Newgrange is generally thought to represent a pre-Christian triple goddess. Some designs are widely known and appear on all sorts of Irish gifts from jewelry to t-shirts to kitchenware. The mysterious and intriguing spiral design at the Hill of Tara is carved into an entrance stone at the passage tomb known as the Mound of Hostages. This is the oldest known structure at the Hill of Tara, dating back to the megalithic era. From the top of the mound, visitors can see the hills at the megalithic site of Loughcrew. We don’t have definitive proof of their original meanings, but when we see these amazing, complex designs on various Irish gifts, we do know that they mean someone feels a strong connection to Celtic roots and appreciates Irish heritage. People in Ireland live with this history all around us. We can visit these sites and appreciate the swirling spirals and other detailed designs, and hundreds of us gathered at the Hill of Tara to walk and dance in our ancestors’ footsteps. And many of us here also chose to wear these designs and designs inspired by them to keep this beautiful heritage in our everyday lives.